Ever hold onto a floral-shaped soap because you didn’t want to ruin the design? You may have thought, “What’s the point of fancy soap if you never use it?” Handmade soap sculptor Amber Earles invented a clever solution. 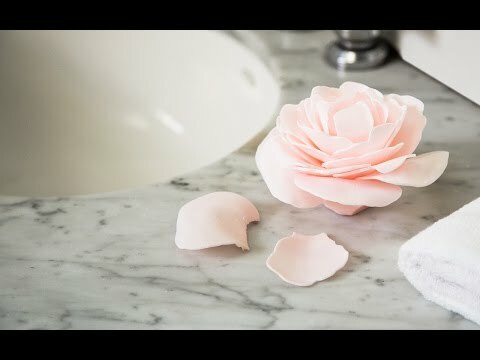 Every petal on Amber’s lifelike flowers is its own individual soap. Gently pick off one and enjoy the natural, vegetable-based ingredients like moisturizing coconut oil and mango butter. Amber handmakes her soaps with high-quality oils for fragrance, free of synthetic dyes and phthalates. The petal-at-a-time design was her response to friends who limited her soap blossoms to decorative use. A’Marie’s soap offers the best of both worlds—skin nourishing ingredients for a shower or shave, while the rest of this flower soap keeps its shape. Hello Grommet! I'm Amber, the founder of A'Marie's Bath Happies and Body Essentials. We deeply appreciate the beauty and nourishment around us, and we strive to bring these elements into each soap experience. I'd be happy to answer any questions you have! Hello Amber, I'd love a red or purple rose to go in my powder room. Will you be listing other colors? Hi Barbara, it's possible for the future, but as of now these are the colors available. I'll let Amber chime in with any further comments on further development. Straight from Amber: there are no more colors yet. Stay tuned! I live in Hattiesburg and I was so happy to see this beautiful product was made in my home state. The best of luck with your business. I will be ordering one here shortly. @Christina - Thank you, Christina! It warms my heart to hear that from a fellow Mississippian! Thank you very much! Hi Amber, I just did some further research on these lovely soaps and found that they contain goat's milk. I am vegan and avoid daily products - some people are allergic as wells so you should update the description. I wonder if you could substitute vegetable glycerin in a later version? Thanks. Hi Margaret, it could be a possibility in the future, but I'll let Amber comment on further product development. Stay tuned! Straight from Amber: They will be looking at variations in the future. The vegetable glycerin option is one she didn't consider, but she appreciates the feedback. Thanks, Margaret! @Margaret - Love your suggestion and would love to be able to offer that in the future Thank you! Do you have a fragrance free option? I wear contact lenses and in general just prefer to use a fragrance free soap. Is it possible for you to just not add scent to what I order? I'd like to second the request for a fragrance-free option. While I can think of some people I'm going to gift with these, I am allergic to most fragrances, especially soaps and candles. Any change of getting one or more fragrance-free options? Beverly, Soraya, it might be a possibility in the future, but as of now the fragranced option is the only one available. I'll let Amber chime in with any additional comments on the future of its development. Straight from Amber: they are considering fragrance-free options in the future. Stay tuned! 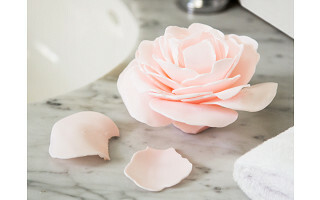 Hi Amber, I think you are darling, with a beautiful product, and I don't want to hurt your feelings, but I buy 4-pack soap petal flowers just like this for $1 at the Dollar Store. In fact, I bought several of them as gift toppers for Christmas last year and they were a huge hit. I also decorate my bathroom with them. True, they are each a little smaller than yours and they are probably made more "wholesomely", but I would prefer to buy 20 4-packs for $20 than 1 for $20. I wish you all the best. They are lovely but $20 for a pretty bar of soap? Bell, C, in so many words, Michelle is right. The handcrafted nature of these soaps made right here in the USA by an underrepresented entrepreneur is what really brings out the value in these soaps. We are excited it hits upon so many of the values we hold in high regard here at The Grommet! @Michelle. Industrialization was the worst thing to happen to the world? Is that a bit dramatic? Prior to industrialization the average unskilled worker would not have time to be having leisurely baths with scented soaps--they would have been too busy laboring for life's essentials during every moment of available sunlight and likely too poor to afford such "artisan work". They would have been exposed to "horribly unsafe' illnesses, cancer from cooking on open flames, starvation from drought withered crops...Because of industrialization you have roads that are drivable, a car to drive on them, electricity to power your ability to look at artisan goods. Again straight from Amber in reference to the Dollar Store alternatives: Each petal is handcut and all put together. Each one is specially made, there are no molds involved, and they only use high quality ingredients making them safer and healthier. Amber and two others are the entire operation and they care about natural and quality products. No, it's not. Because we have the ability to, we have invented ways in which to make life easier. Sure, HUMAN lives are better. But I said the WORLD. The overpopulation of humans is terrible for the world. We dump tons and tons of toxic waste, and our environment suffers for it. I will say again, industrialization is the worst thing to happen. Our gene pool has been weakened because modern medicine keeps those alive who would have died from diseases they could not fight. Anyway, I'm not on here to debate. Michelle, Maria, you are both are making valid points about the philosophical notion of industrialization, but we want to make sure the board is used for questions and feedback relating directly to bath happies. We are happy to answer any questions you have! @Michelle Pleeezzzzz... This is just soap folks... How the heck did you all get started with all this social -ecological-vegan-commentary. If you don't like it, don't buy it. Don't dump all your frustrations with the world on to this woman who has had the talent , energy and dedication to create a beautiful product designed to make your crazy lives a little less intense and stressful . Chill out and smell the Roses...or Peonies or Lillie's . @Bell Hi Bell, I appreciate your comment! That is great and glad that you found a product that you love! We certainly off the best price that we can for all of the effort and ingredients in them. @Amber I have personally seen this soap being made (I live here in MS), and it's labor intensive. It requires hand crafting skills to roll each individual flower by hand. No one will probably duplicate these flowers because of how complicated and time consuming the process is. It's a specialty product, and not a mass produce product. It's also some of the most soft, lathering soap I've ever used. Is it worth $20? If you ask me, it's worth more than that. It would make a wonderful, unique gift or something to indulge in for yourself. We waste money on $5 cups of coffee, so this American, hand-made product is by far not a waste of your money. Hello Amber..These soaps are so very beautiful. I would like to know if each soap has a floral scent to match it. does the Rose soap smell like a real rose? I hope so !!! Hi Louise, it doesn't smell like a rose instead it is a soft clean, water-type scent. I'll let Amber chime in with additional details as to what that means. Stay tuned! An update from Amber: the peony is a peony scent. The lily is the scent of soft, floral notes but isn't lily specific. These are beautiful! I wish I could get one, but as a vegan, I do not use products made of the bodily fluids of other animals. Goat milk belongs in the stomach of baby goats, not smeared on the body of humans. If a vegan option is ever formulated, I will buy these in a heartbeat! Beautiful work! Hi Michelle, I'll let Amber chime in with a comment about further product development. Stay tuned! Hi Michelle, as I mention above, Amber says that further options will be available in the future. Stay tuned! @Michelle Hi Michelle - Thank you very much for your comment! We will likely offer this option as well. Would love to try new vegan blends. These soaps are lovely! How many daily showers would one petal last? Regardless, they are beautiful. Vibrant colors, especially for the lilies,would be perfect. @kira @MJ The petal life will vary based on the size of the petal you pick off the flower and how long you lather up. Kira, MJ, Marcia is right. It will depend on the petal you select. With the peony & rose flowers, some will last longer, but you can save petals for next use if using to wash your hands. would be so cool if you did some in the shape of artichokes as well! @christopher that's a cool idea for a kitchen soap! Beautiful. How do they ship? They seem so very delicate. Hi Brenda, they put the bath happies in a gift box with an adhesive on the bottom to stabilize and then put in a shipping box upright to maintain the structure. @Mike Good to know. Thank you so very much. I love the size of these. I think they are well worth the $20.00 for a handcrafted work of (useable!) art! That is great to hear, Brenda! What about doing herbal scents like mint, eucalyptus, rosemary, ect. Some people don't like floral scents or are allergic, as well as having scents that aren't as distinctly feminine could expand your market. How do you add the scents to the soap? Do you use essential oils or extracts? @Lisabel Hi Lisabel! That is exactly what we are moving toward! Love those scents and ideas! We add as the soap is cooler to help keep the oils in tact. We have used essential oils but are interested in all of the extracts as well! I've used this soap, and it's wonderfully silky-smooth. I'm also a man, and it makes shaving my tree stump whiskers on my face a more pleasant experience. The scents are unique as well. When you see it, you'll know how much care and effort was put into making this product. Men, give a try for your man grooming, or buy your wife and be back on the #1 list. Do yourself a favor and getcha some! 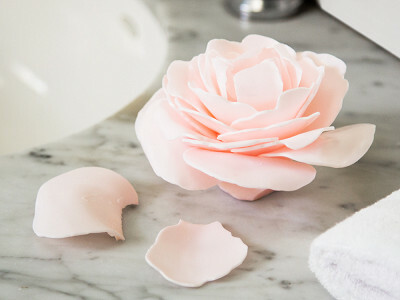 Ever hold onto a floral-shaped soap because you didn’t want to ruin the design? You may have thought, “What’s the point of fancy soap if you never use it?” Handmade soap sculptor Amber Earles invented a clever solution. Every petal on Amber’s lifelike flowers is its own individual soap. Gently pick off one and enjoy the natural, vegetable-based ingredients like moisturizing coconut oil and mango butter. Amber handmakes her soaps with high-quality oils for fragrance, free of synthetic dyes and phthalates. The petal-at-a-time design was her response to friends who limited her soap blossoms to decorative use.